Let's work through the screenshot below to describe the settings. Discount type. If you're using Class Passes you can choose to make this code specifically redeemable against class pass purchases. Otherwise select ticket discount. You will need to create separate discount sets if you would like a discount for both tickets and class passes. Restrict from date. Discounts will be able to be used against events that occur from the very beginning of this date (00:01 on 24th Jan 2019 in this example). Restrict until date. Discounts will be able to be used against events that occur up until the very end of this date (23:59 on 1st April 2019 in this example). Discount applies to. As well as a to and from date, discounts can be restricted by entry, ticket or tag. If you click Add usage restriction you'll see your options. 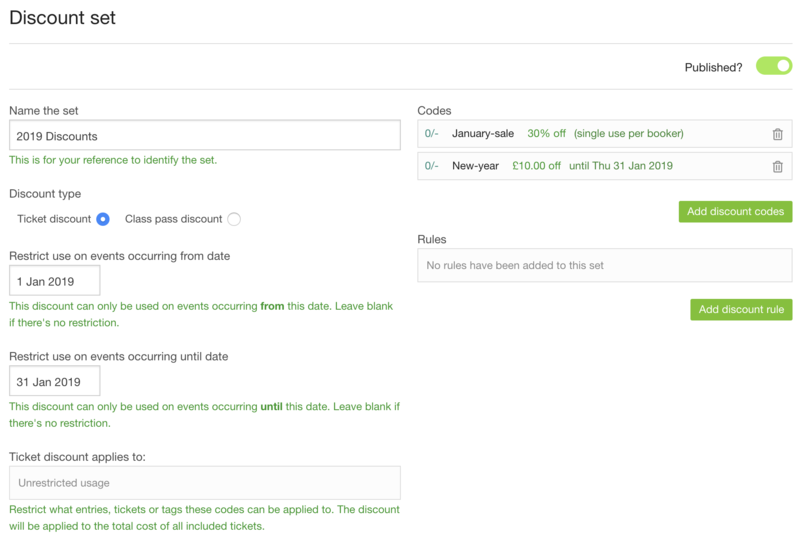 Leaving it completely blank will simply mean the discounts can be applied to all events in your schedule page. Codes. If you click Add discount codes you'll see a sub-menu of settings. This is where you can specify your code, or list of codes. You can also set the expiry date, whether it can be used more than once per booker, and other settings. If you need to edit these settings, you need to delete (see bin icon) and re-create again. Rules. This section is strictly for block booking discounts. Please see our help article on block booking discounts here. Published? - You can toggle this to unpublish and republish the discount set any time. It will not delete the discount. To use a discount code, the booker must enter the code on the 'selected items' page before starting the booking by clicking the 'Add a discount code' option. After clicking Submit code the total cost will be automatically amended as per the settings of the discount code. Please note: Customers cannot use more than one discount code at a time at checkout.